Rental price growth is beginning to catch up with house price growth. For years, Canadian house prices outpaced rental price growth by leaps and bounds. But recently it’s started to look like rents may be catching up. Apartment listings site Padmapper’s latest monthly rent report for Canada shows two-bedroom units in Vancouver and Toronto — Canada’s priciest places to rent — have jumped by 14.5 per cent in both cities in the past six months. Check out the rental rates for one-bedroom units across Canada’s largest cities. Prices aren’t rising everywhere. In Calgary, two-bedroom apartments have fallen 4.7 per cent in the past six months, to $1,280 a month. The city has fallen to fifth-most expensive place in Canada to rent, from third place half a year ago. News reports out of the recession-racked city suggest a lot of rental space is sitting empty there. 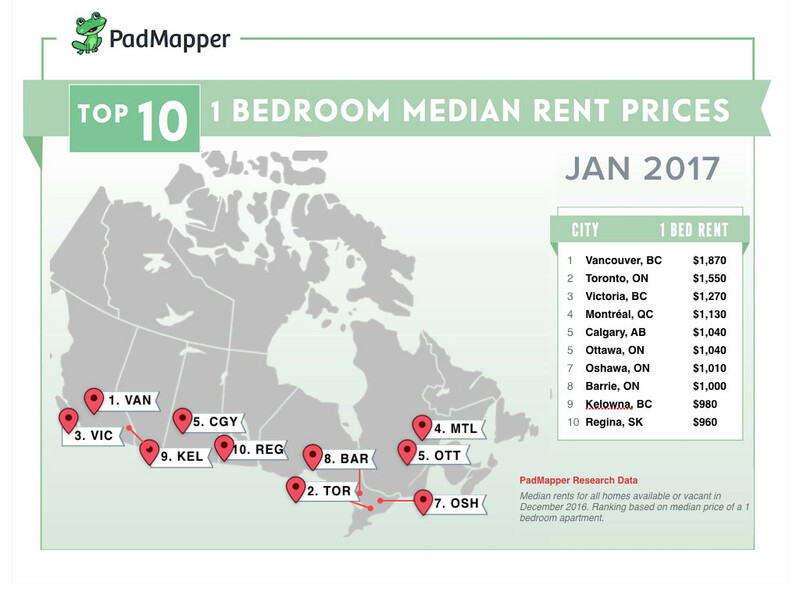 Across Canada, the picture is mixed, with 12 cities showing rising rents, 10 cities showing falling rents, and three with little change in the past month, Padmapper reports. Real estate experts who’ve noted this acceleration in rental prices say there are a number of reasons for it. One is that rising house prices in some cities are forcing homebuyers to save up for longer, meaning they have to live in rental units longer than they used to. Also, as real estate consultancy Urbanation noted this week, landlords are selling their condos to take advantage of high house prices, reducing the supply of available homes for rent. There were 8 per cent fewer condo rental listings in Toronto last year, and 2 per cent fewer condos rented out, than a year earlier, Urbanation said. Prices for rental condos jumped 12 per cent in the inner city in 2016.